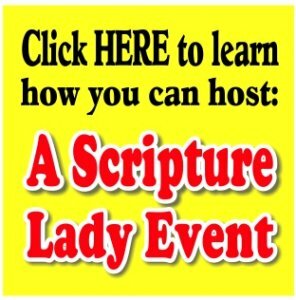 The Scripture Lady loves creating Bible lessons for kids! 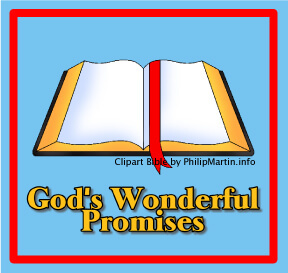 Here is one called “God’s Wonderful Promises” to help learn about God’s promises. Have you ever broken a promise? I know I have and it’s not something I like doing or having done to me. I bet your kids have experienced this same thing, but what a blessing it is to be able to tell them that God NEVER breaks His promises. All of His promises are sure and true. They’re like “money in the bank” as the saying goes. This Bible activity idea will introduce your kids to many of the great promises in the Bible and will hopefully show them how to apply them to their lives. If you don’t already own one, I HIGHLY suggest that you purchase a book of Bible Promises. There are many different kinds. Here are just a few that amazon.com offers. you feel…discouraged, worried, lonely, etc.” You could actually print the site’s entire list and make up your own book. Print it on nice card stock or paper and place it in a binder. Now to help your kids access God’s wonderful promises, encourage them to take about five to ten minutes of your class time, if in a Sunday School situation or time out of their day at home, to think of a situation in their life for which they need God’s help. Introduce them to your Promise Book. Ask them if there are any areas of their life that fit one of the categories of promises that are listed. Once they find an area of interest, now encourage them to start a Promise Journal. You could provide pre-made books for each of your kids, or you could have them participate in making their own. Either way, tell them to place the day’s date and have them write one or two sentences that describe the problem or need they have in their life right now. Next, have them choose one or two promises that fit their particular need and have them copy the promise into their journal. Finally, take a minute to pray over the situations your children have shared and ask God to fulfill His promises in their lives. Have them come back a week later and report in their journals any headway they have seen God do through the promise He gave them. Not only will this exercise be an encouragement for your kids to take hold of God’s promises, but it will help them to learn to be patient for God to answer their prayers. It’s also good to point out that God wants us to come boldly to His throne of grace and ask for what we need. Tell your kids that they can also “remind” God of His promises in their prayer time by saying something like, “Father, You’re Word says….I believe in Your promises and will wait for You to work them out in my life.” Another point to bring up to your kids is that God’s promises are not like “rubbing a Genie’s lamp” and getting your every wish granted. Relying on God’s promises is relying on the truth of His Word and ultimately upon God Himself. If you liked this Sunday School/Homeschooling idea, then sign up to receive Scripture Lady’s Free Email Kid Tips packed full with creative ideas and receive 6 FREE Bible Review Games to help get the kids you minister to excited about the Bible!